Jan 30, 2018 NP Questions & Answers leaflet: post-Reg14 Consultation. Nov 9, 2017 Notes from a meeting with CDC. Aug 22, 2017 Update for Parish Noticeboards. Aug 22, 2017 Update to full meeting of the Parish Council on the Village Design Statement (VDS). May 04, 2017 Update on SEA Screening Determination. 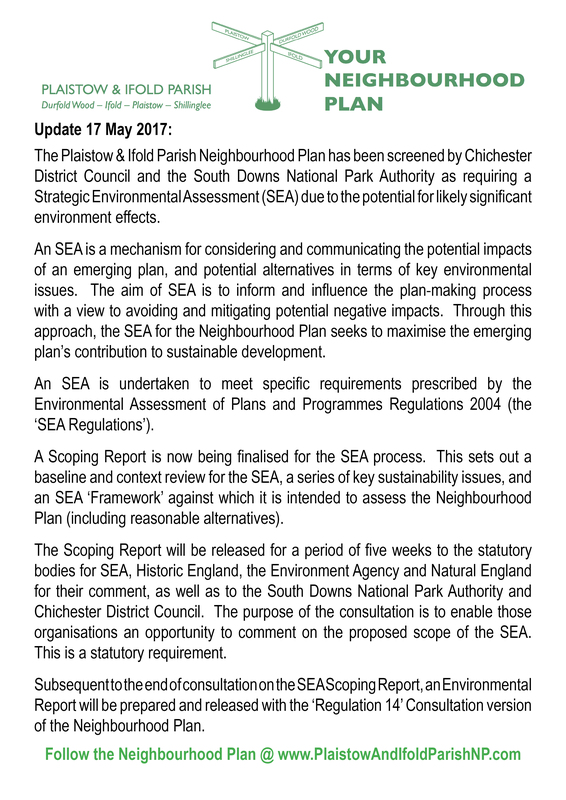 Apr 26, 2017 Update on SEA Screening Opinions. Jan 25, 2017 Parish Council representations to CDC SA DPD. Jan 11, 2017 Report for meeting of the full Parish Council on 17 Jan 2017 (See attachments: Arboricultural Impact Assessment Report and Tree Plan for the Site: The Dairy, The Street, Plaistow). Nov 23, 2016 Minutes of a meeting of the full Parish Council. Nov 18, 2016 CDC – SEA Screening Opinion Determination. Nov 13, 2016 NP Questions & Answers leaflet. Oct 18, 2016 Minutes of a meeting of the full Parish Council. Sep 29, 2016 Letter to CDC requesting an SEA Screening Opinion. Sep 28, 2016 Answers to address questions and concerns raised in a residents’ letter to the Parish Council. Sep 28, 2016 Minutes – Extraordinary meeting of the full Parish Council. Sep 13, 2016 Meeting of a full Parish Council (Attachment: report to Parish Council). Sep 12, 2016 Meeting of a full meeting of the Steering Group. Sep 12, 2016 Site Assessment Matrix for 12 Sep 2016 Steering Group Meeting. Sep 12, 2016 Site Analysis produced from 12 Sep 2016 Steering Group Meeting. Sep 05, 2016 – Minutes of a meeting of members of the Steering Group (Sara Burrell – Parish Council Chairman, Beverley Weddell – Parish Clerk, Cllr Vivien Forward, Richard Wyatt – representing Plaistow Village Trust; and Christine Gibson-Pierce) with CDC Planning Officers (Mike Allgrove, Valerie Dobson, Sue Payne and Tracey Flitcroft). Aug 17, 2016 Letter from the CDC – Housing Delivery Team. Aug 17, 2016 CDC – Plaistow & Ifold Parish Housing Information. Aug 02, 2017 Minutes of a telephone conversation between members of the Steering Group and AECOM. Jul 08, 2016 ‘Call For Sites’ Closed. 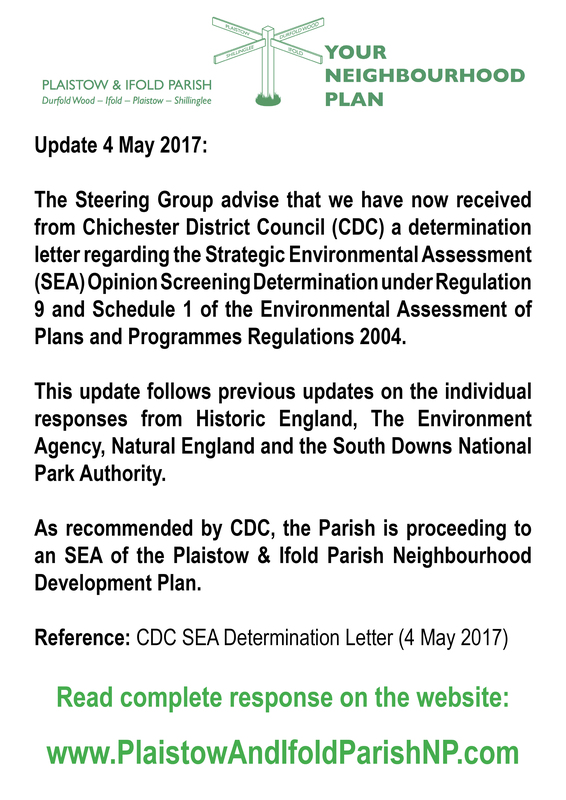 Jun 28, 2016 Steering Group – Proposal to the Parish Council. Jun 06, 2016 Update for Noticeboards. May 26, 2016 Recommended Sites. May 26, 2016 Minutes of a meeting of the full Parish Council. Apr 21, 2016 Minutes of a meeting with CDC. Mar 15, 2016 Minutes of a meeting of the full Parish Council. Feb 18, 2016 Parish Council representations to CDC Site Allocations Development Plan Document (SA DPD). Jan-May, 2014 The Glass-House Community Led Design – Project Support Report. Dec, 2013 The Glass-House Community Led Design – Project Support Report. Jul 04, 2013 Meeting of Neighbourhood Plan Groups. 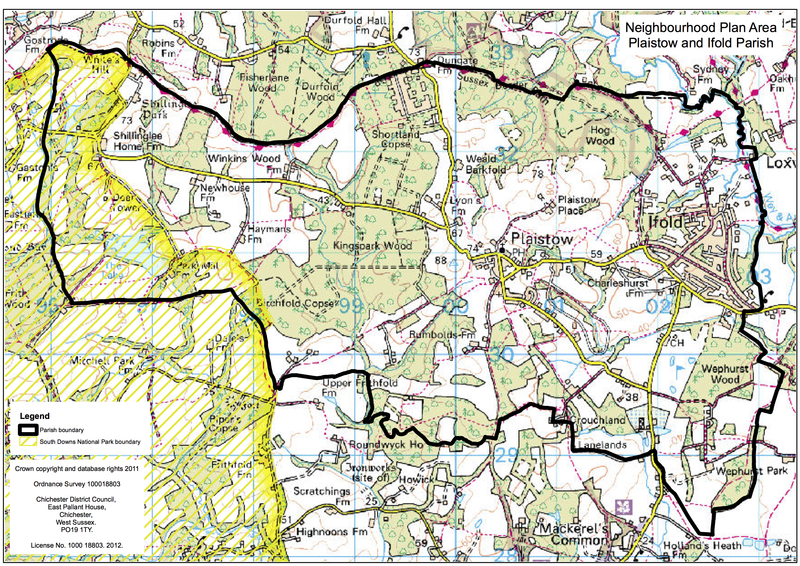 Mar 14, 2013 Designated Neighbournood Plan Area SDNP– The SDNPA designated the area of Plaistow and Ifold Neighbourhood Area within the South Downs National Park on 14 March 2013 following an application from Plaistow and Ifold Parish Council. May 11-12, 2013 Summary of Ifold Consultation. 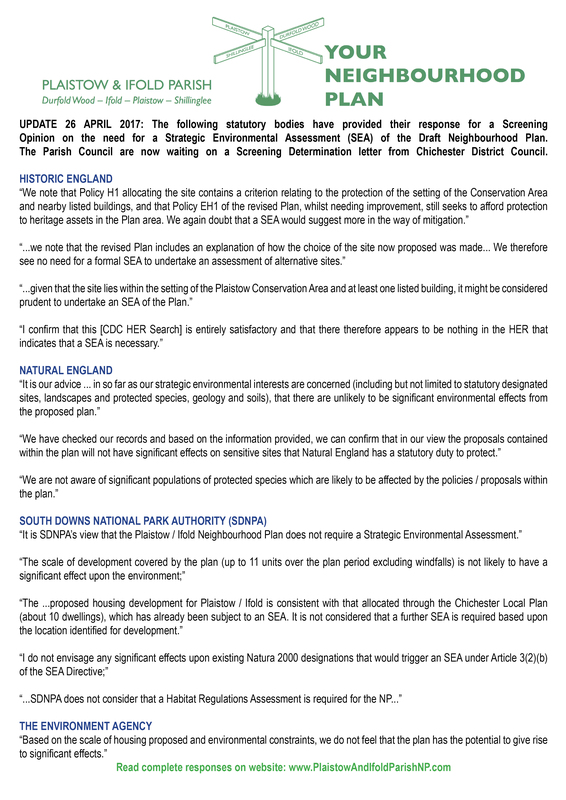 Nov 06, 2012 Letter from CDC regarding Designation of Neighbourhood Plan Area. 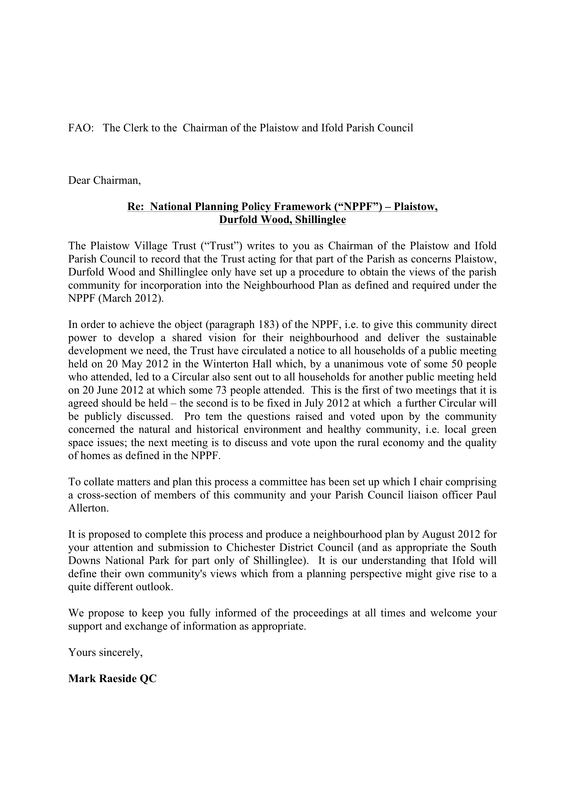 Jul 02, 2012 Letter to CDC applying for designation as a Neighbourhood Plan Area.